Unlike regular physics, you can’t use a staticmesh for soft physics. You need to have a SkeletalMesh instead. Find an appropriate SkeletalMesh model, or import your own. SkeletalMeshes are PSK files. 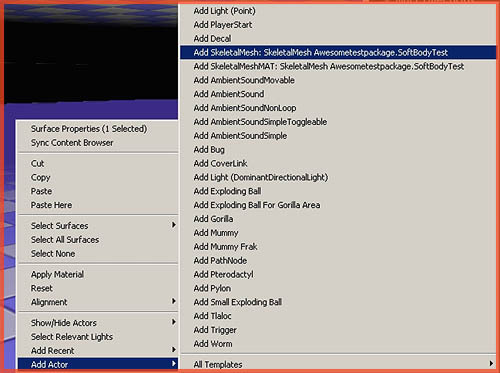 Import the SkeletalMesh in a package of choice. After importing it, open it by double clicking it. 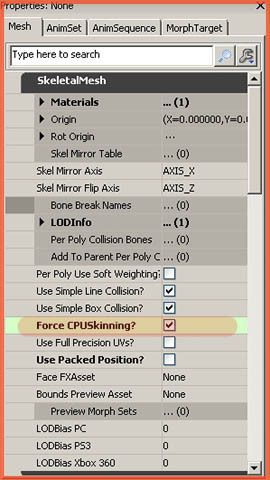 In the Mesh Tab, enable Force CPUSkinning. Next up, scroll down some more and find the SoftBody section. Add the bone it should use in Soft Body Bones. In my example mesh that bone is named “Joint1″ so type that. The names of the bones can be seen in the Skeleton Tree section, or by enabling bone names in the viewport. Also Enable Soft Body Line Check, and lower the Soft Body Stretching Stiffness value. The latter is how much it will respond to an impact. Now generate the soft body surface. There is a button at the top that does this, it has a green pyramid on it. 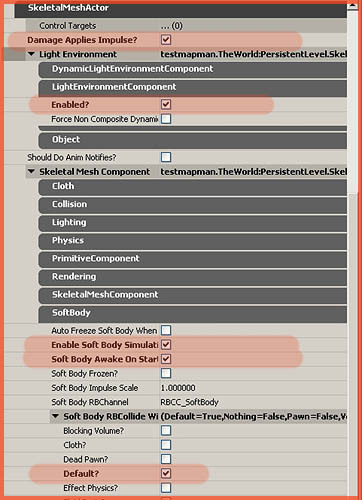 You can preview the soft body physics with the button on the right of it. Add the SkeletalMesh to the level. 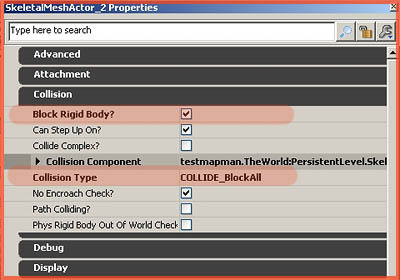 Open up its properties, go to the Collision section, set Collision Type to Collide_Blockall, and Block Rigid Body True. 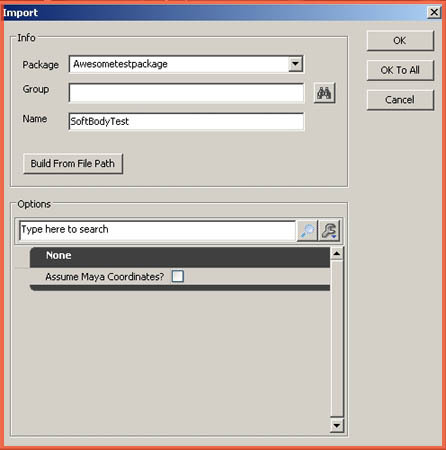 In the section SkeletalMeshActor – LightEnvironment enable Enabled? if it hasn’t been already and at the very top of notice Damage Applies Impulse?, enable that as well. 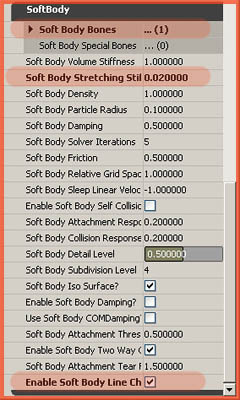 Then continue by navigating onto the Softbody section, and Enable Soft Body Simulations, and Soft Body Awake On Startup. Also be sure to add at least the Default channel as a channel to collide with. Now go play the level, and shoot the mesh!